This Story Happened Before… It’s the damn truth! It did happen before. Many times. In Europe, in Asia, in America. Centuries, many centuries ago it happened. Last year it happened in Paris. And now, Brussels… Leaders of Europe: pay attention! This story happened before and it might happen again! 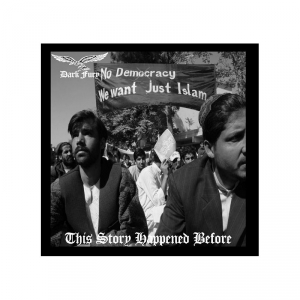 Like prophets, Dark Fury appropriately called their newest album This Story Happened Before. It was recorded by band leader K. (he also owns the Lower Silesian Stronghold label) and Hetman Diathyrron, who did some studio drum sessions in the past too for Dark Fury, by the way. It comes out in an edition of 500 copies and includes specific / explicit artwork and messages! All hail the Pagan Front! I have always ‘liked’ this project – please enter the band’s name on top at the right in the ‘search’-tab to find out some other reviews; idem for the label! And of course it is not different this time. The album (which is also available on cassette, by the way) is quite a short (clocking just over half an hour) but intense monster production. And with ‘production’ I’d like to start with the sound quality. This one is just fantastic. It’s lo-fi but not under-produced, and it includes a fine mix of all instruments. Once again the lack of clinically polish is the right choice! The compositions, then again, go on in the vein of the past. This Story Happened Before opens with Sharp Steel, being a killer track. It starts with a massive riff, quite hypnotic, melodic and slow, and after about a minute an additional lead empowers the mesmerizing atmosphere. The drum parts play quite an important role in order to create power (just listen to the intervention at two minutes! ), and the vocals are as dry and nasty as something dry and nasty. Sharp Steel is a mighty epic to start with! With Goatfuckers (I wonder whom those people referred to with this nickname might be – bèèèèè! ), Dark Fury go back to the faster essence of the earlier nineties’ scene, maintaining the glorious melody lines that characterise this project since the very beginning. And this goes for most of the pieces, being old fashioned in approach, intolerant in execution, honest in essence, victorious in atmosphere. So it must be. Once again the balance in between faster (don’t stop the darkest fury in Anthem Of Upcoming War!) and slower pieces (Messenger Of Inevitable Death, for example, mercilessly blusters like a tank onwards to the war field) turns out to be so natural, so logical, but the very same goes as well for the equilibrium in between pounding rhythms and epic melodies. Don’t ask me why (I won’t give you an answer anyway), but this album might be the strongest Dark Fury album to date (at least from those whom I’ve experienced). It’s a subjective given, I confess, but even if you do not agree (and what do I care) you cannot deny the glory of this Polish horde! Hail! Onwards to victory! Destroy the enemy! Eliminate the terrorist pigs!